File contains two spiral-bound diaries kept by Barbara Hinds between July 13, 1960 and August 9, 1960. 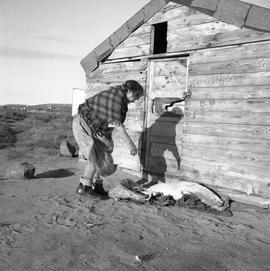 The diaries record Hinds' activities during a visit to Fort Chimo (now Kuujjuaq), Quebec. File contains a hand-drawn map of Northern Quebec. The map is a rough outline of the province with points that indicate official posts and regional surveys. File contains a handwritten letter written by Barbara Hinds for Harold. The letter was written while Hinds was in Fort Chimo. 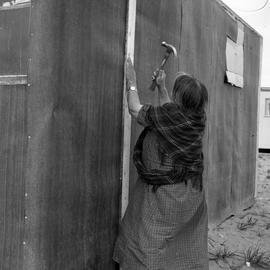 Item is a photographic slide depicting Alicie Berthe at the door of a rough wooden building. The building is a store house belonging to her family and it is located near the Kosoak River. 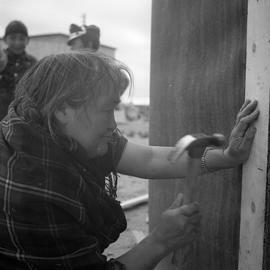 Item is a photograph of Alicie Berthé hammering something on the wall of her house in Fort Chimo, Quebec. She is wearing a tartan shawl and plaid dress. 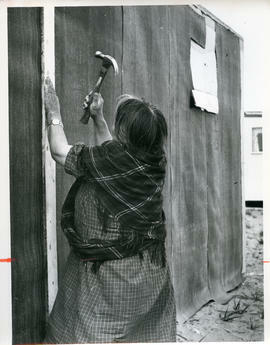 Item is a photograph of Alicie Berthé hammering a nail on the wall of her house. The photograph was taken in Fort Chimo, Quebec. 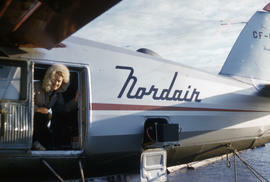 Item is a photographic slide showing Barbara Hinds looking out the door of a Nordair airplane. 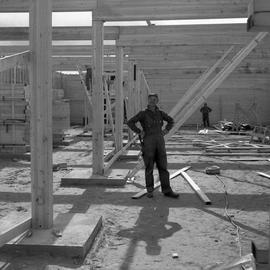 Item is a photograph of Bertrand Berthelot, the carpenter in chief at the construction of the provincial school in Fort Chimo, Quebec. 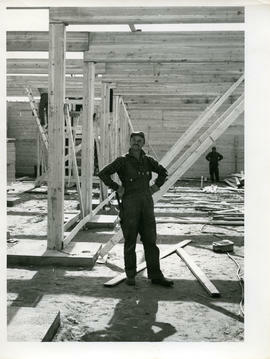 Berthelot is standing with his hands on his hips in the frame of the unfinished building. 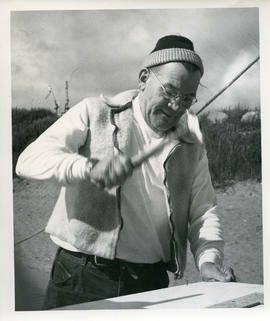 Item is a photograph of chief marine mechanic Bill Walker hammering something while refitting a boat called the Joan Ryan. The photograph was taken in Fort Chimo, Quebec. 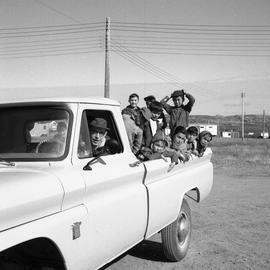 Item is a photograph of Canon James Clarke driving a light-coloured pickup truck. There are several children in the back of the truck. 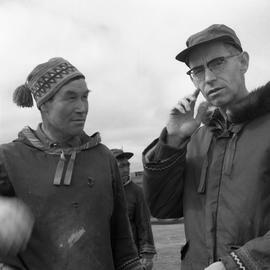 Item is a photograph of Charlie Saunders and Canon James Clarke standing together in Fort Chimo, Quebec. Saunders is the president of the local council and Clarke is from the Anglican Church. Saunders is wearing a crocheted toque with a tassel. 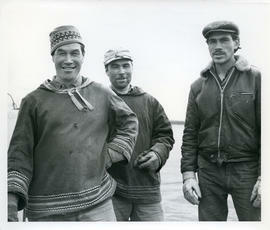 Item is a photograph of two freight handlers named Charlie Saunders and Johnnie Berthé standing with a third unidentified man. 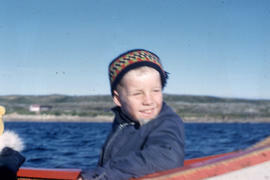 The photograph was taken by the Koksoak River in Fort Chimo, Quebec. 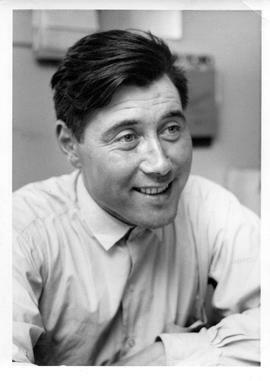 Item is a photograph of George Koneak wearing a white shirt and smiling. 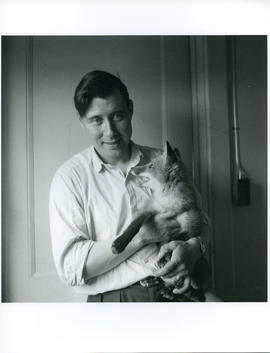 Item is a photograph of George Koneak holding his pet fox. 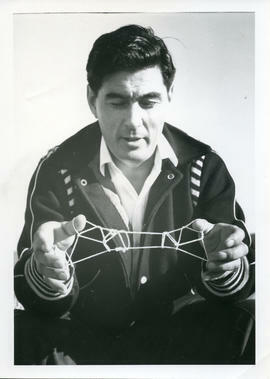 Item is a photograph of George Koneak playing cat's cradle. The photograph was taken in Fort Chimo, Quebec. 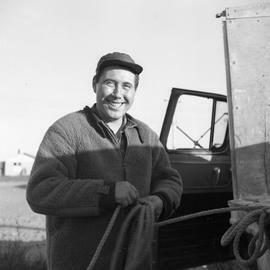 Item is a photograph of George Koneak standing by a truck and wrapping a length of rope. The photograph was taken in Fort Chimo, Quebec. 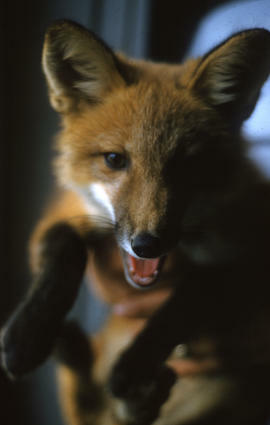 Item is a photographic slide depicting a fox who is being held by a person. 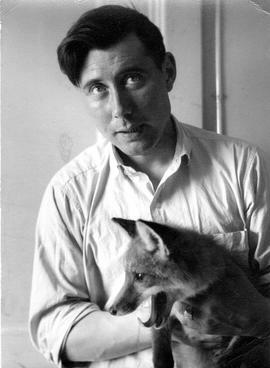 The fox belongs to George Koneak. 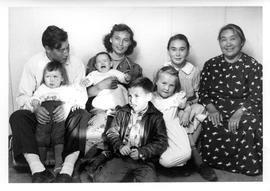 Item is a photograph of George and Joanna Koneak sitting with an older woman and five children. George and Joanna are each holding one of the children. 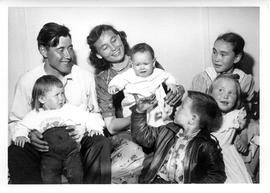 Item is a photograph of George Koneak with his wife (Joanna Koneak) and five children. George and Joanna are each holding one of the children and they are sitting in a group. 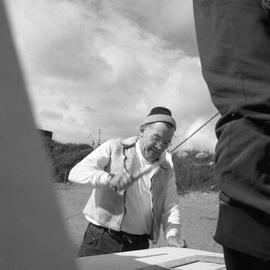 Item is a photographic slide depicting George Koneak roping a canoe onto a truck in Fort Chimo, Quebec. Item is a photograph taken in Fort Chimo, Quebec. 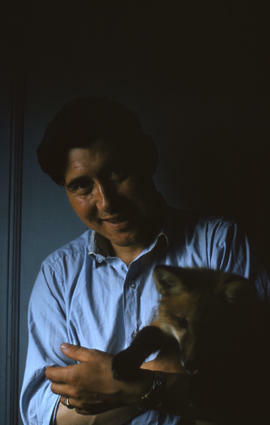 The photograph shows George Koneak holding his pet fox. Item is a photograph of Jacques Dumas, from the St. Felicien Air Service. Dumas is standing in front of some machinery and smiling. 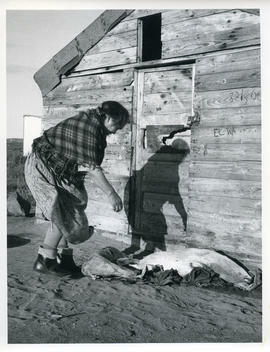 Item is a photograph of Jeannie Snowball, the creator of the first Ookpik (or Oogpik) figurine. She is wearing a floral dress and laughing. Item is a photograph of a girl named Jessie who is picking berries in Fort Chimo, Quebec. She is wearing a patterned jacket. Barbara Hinds' camera bag is obstructing the image. Item is a photograph of Jimmy Koneak sitting in front of a house and holding an accordion. His wife is standing next to him. 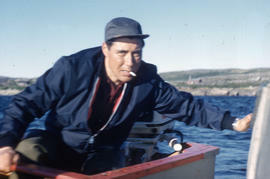 Item is a photograph of a blind man named Jimmy Koneak from Fort Chimo, Quebec. Koneak is sitting in his house and playing the accordion. 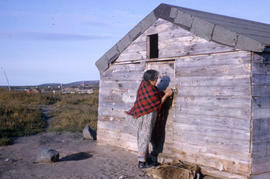 Item is a photograph of a blind man named Jimmy Koneak who is sitting in front of his house in Fort Chimo, Quebec. His wife is standing next to him and he is holding an accordion. A child is looking through the window behind them. Item is a photograph of a blind man named Jimmy Koneak who is sitting in front of his house with his wife, a girl, and a boy. Koneak is holding an accordion. Item is a photographic slide depicting Joanna Koneak standing in a doorway while carrying a baby on her back. Koneak is wearing a traditional white parka. 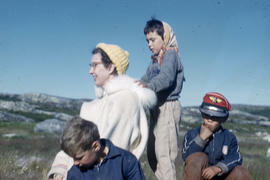 Item is a photographic slide depicting Joanna Koneak standing in a doorway with a baby on her back and another child standing next to her. 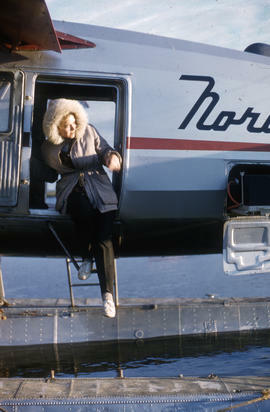 Koneak is wearing a traditional white parka. 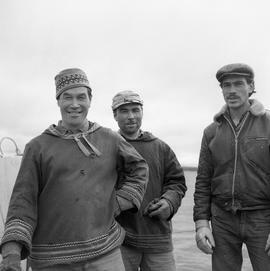 Item is a photograph of Josephee Ananak and Ned Emudluk, two men helping to refit a boat called the Joan Ryan. Ananak is smoking a cigarette.